Will Bad Teeth Affect Your Overall Health? Apart from ruining your smile, cracked, missing and rotting teeth may have severe adverse impact on your general health, some of which may be life-threatening. Hence, if you are delaying the regular checkup of your teeth or a visit to your dentist, think twice before doing so. The article discusses several ways in which bad dental health can impact your overall health. Can Bad Teeth Make You Sick? It has been backed up by scientific evidence that oral bacteria can result in infection in other areas of the body in people whose immunity has been weakened by medical treatments (for other illnesses) or systemic diseases such as infective endocarditis or poorly controlled diabetes. An infected/decayed tooth may form a focus of infection that increases the risk of several systemic illnesses. When regular brushing and flossing is not done to clean your gums and teeth, plaque and bacteria accumulate on the gum line resulting in gingivitis that may gradually infect the bone surrounding the teeth resulting in periodontitis. This ultimately results in aggravation of several illnesses. People who have periodontitis are two times more likely to have heart disease in comparison to those who do not have gum disease. The exact reason for this is not known, but according to one theory, harmful oral bacteria enter into your blood and get attached to fatty plaques in the blood vessels of your heart, resulting in inflammation and increasing your risk of blood clots, which can cause heart attacks. Can bad teeth make you sick? According to research, poor dental health is linked to increased risk of memory loss. Experts believe that bacteria from mouth may reach the brain either through the blood or via cranial nerves, which connect to the jaw and may result in the kind of plaque that’s been associated with Alzheimer’s disease. People who suffer from diabetes are more prone to have gum disease in comparison to those who don’t have diabetes. The cause of this may be that diabetics have increased susceptibility to infections; however, research has also found that gum disease makes it difficult to control blood sugar. Moreover, treating gum disease helps improve the symptoms of diabetes. According to a research published in the Journal of Periodontology, the risk of respiratory infections including pneumonia and COPD are increased due to gum disease. The respiratory infections may occur due to inhalation of oral bacteria into the lungs, causing inflammation of the airways. Can bad teeth make you sick? One research found that females of childbearing age who suffered from gum disease got pregnant in around seven months, whereas, females in the same age group without gum disease took five months on an average to get pregnant. Another research found that pregnant females who had gum disease have greater chances of miscarriage. According to research, a link has been found between periodontitis and rheumatoid arthritis, an autoimmune disease characterized by inflammation of various joints of the body. Experts say that the mechanism in which the connective tissues are destroyed in both RA and gum disease is similar. Visiting your dentist on a regular basis, eating a well-balanced diet, and maintaining good dental hygiene helps in reducing the risks of gum disease and tooth decay. Ensure that you brush two times in a day, floss daily and use a mouthwash (antiseptic) once every day. After knowing the dangers of"Can bad teeth make you sick? "you may want to know how to take care of your teeth. You should brush your teeth at least two times every day. Plaque, a layer of bacteria that sticks to teeth, is removed by brushing. When the bacteria present in plaque react with food, they release acids, which results in the formation of dental cavities. Use a toothbrush that is soft. Put toothpaste (fluoride) of the size of pea on the head of your toothbrush. Put toothbrush against your teeth at an angle of 45 degree up to gum line. Move brush across teeth in small circular motions. Continue in this motion and clean one tooth at a given time. Make the brush bristles reach the spaces in between the teeth. Brush on top of chewing surfaces of teeth. Clean backside of lower and upper teeth. To clean inside of front bottom teeth, angle the head of the brush to the bottom of the mouth and move it in a circular motion. To clean inside of top front teeth, angle the head of the brush to the roof of the mouth and move it in a circular motion. Brush your tongue with few gentle strokes from back to front to help remove bacteria. Brush your teeth for 2-3 minutes, and then rinse your oral cavity with water. Change your old toothbrush every 3-4 months. You should floss your teeth once daily. Flossing removes plaque and food that gets stuck between teeth. If plaque is not removed, it hardens into tartar and only a dentist can remove it. Take around 18” of floss strip from dispenser. Tie floss around middle fingers of your hand, leaving 1” open for flossing your teeth. The top teeth are flossed first. Put floss in your oral cavity. Use index fingers to make the floss go between your teeth. The floss should be moved up and down against tooth and also up and around gum line. Floss should be done between every tooth and behind back teeth. Rinse your mouth using an antiseptic mouthwash once a day. It helps in killing bacteria, which may result in plaque formation and gum disease. You can rinse either after or before you brush your teeth. Swish mouthwash for at least 40-60 seconds in your mouth. To maintain good oral health, minimize intake of foods that have starches and sugars. Hard candies that are sucked are particularly harmful as they stay for a long time in the mouth. Get a dental checkup once in every 6 months. 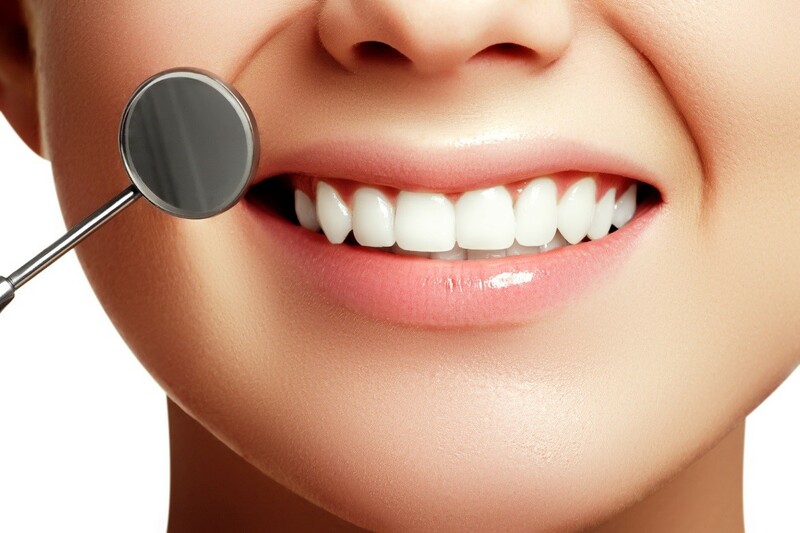 To maintain good oral and dental health, it’s imperative that you have dental checkups regularly. You should also visit your dentist if you suffer from toothache, bleeding or swelling in gums.